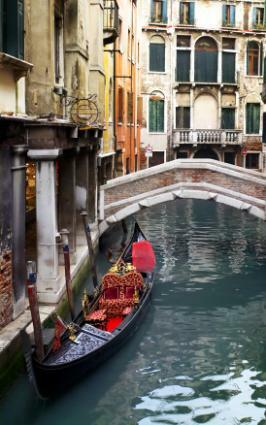 Venetian interior design is inspired by the famous city of canals and bridges - also known as Venice, Italy. The romance and lure of this island city is legendary due to Venice's celebrated art, culture, and architecture. During the Renaissance period of the Middle Ages, the Italian cities of Florence and Venice were at the center of this enlightening movement. Venice in particular became known for classical influences gleaned from studying ancient Greek and Roman culture. The Renaissance movement later spread to other European countries. During the 1600's, Venice grew to be one of the significant musical centers on the continent. In addition to scientific and intellectual advances, the art world also leaped forward. Renaissance era artists such as Leonardo da Vinci, Raphael, and Michelangelo elevated artistic pursuits to a new level and helped to develop the idea of perspective in paintings. Artists of the period also studied human anatomy, light, and shadow in an effort to portray natural beauty and lifelike imagery. The Carnival of Venice also added to the opulent, festive reputation of the city. This lavish festival goes back to the 1200's and features whimsical, decorative masks and fanciful costumes. The enchantment of this event includes music, games, magic, street performers, and theatrical shows. In addition to the magnificent classical architecture of Venice's stone and marble buildings, Venice is also known for its glass, mirrors, and ornate artwork. The art of glassmaking first became a major part of the Venetian art scene during the 1200's to 1400's. The nearby island of Murano grew to be the hub of production for this sophisticated and colorful art glass. The Murano glassmakers continue to carry on the time-honored techniques as they craft chandeliers, jewelry, mirrors, and art glass. Some of the crafts they have perfected include multicolored glass, glass gemstones, crystalline glass, and milk glass. Beautiful Venetian mirrors are still used in a variety of interiors from eclectic to traditional. Venetian mirrors feature elaborate frames made of cut, etched, or beveled mirror pieces. The carved effect is stunning and helps to catch the light in pleasing ways. The frames of these highly polished mirrors are occasionally accented in black or vibrant jewel-toned colors like red or yellow. Celestial themes come up as another popular theme in Venetian interior design. Wall plaques often incorporate glittering images of the sun, moon, or stars. 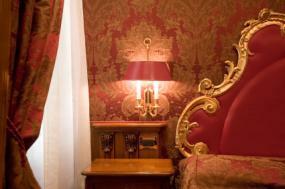 The use of gold or silver metallics is crucial to a Venetian style room. This can include gilded chandeliers, gold leafed crown molding, or even hand-painted metallic accents on furniture. Fortuny lamps make a nice addition to a Venice-inspired design due to their graceful shapes and fine silk or glass components. The diverse, intellectual history of Venice can also be recreated by displaying an eclectic mixture of art and accessories such as those collected on worldwide travels. Try filling bookcases or shelves with vintage books and interesting objects which you can find at flea markets, thrift stores, and estate sales. Venetian interior design can also be energized by paintings or murals which depict dazzling scenes of this unique city island. There are wonderful art prints and oil paintings featuring the dramatic canals, gondolas, and bridges of Venice. Place one of these art pieces in an ornate gilded frame for maximum impact. You can also integrate the look of old world Italy by using a Venetian plaster wall finish. This stylish faux finish creates a marble-like appearance on walls by showing off the light and dark tones of the same color. The polished, reflective surface of Venetian plaster is perfect in an entryway, dining room, or formal living area. Horchow - Venetian mirrors, masks, lighting, and more. The Venetian - Get a sample of Venetian interior design at The Venetian Resort Hotel Casino in Las Vegas.